Giant bundles of marijuana, apparently containing individually wrapped five-kilo bricks, have been washing up on the shores of Flagler Beach, Florida since the approach of Hurricane Florence last week, possibly from a boat that was either capsized by the storm or an airplane drop gone wrong. The Flagler Beach Police Department said that about 10:55 a.m. Wednesday, citizens reported finding a large package that had washed ashore in the area of 6th North Street and North Oceanshore Boulevard. 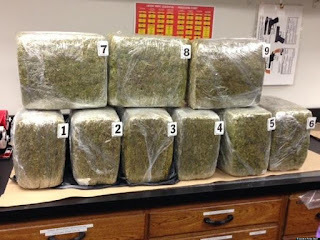 When officers opened the package, they found it contained six smaller 12-inch by 12-inch packages stuffed with marijuana. Hours later, the Flagler County Sheriff’s Office said a beachgoer in the area of North Ocean Shore Boulevard found four circular bundles and 13 brick-style packages of narcotics and called authorities. It’s unclear if the two incidents were related, but the U.S. Coast Guard was contacted to investigate both cases. Officials from the Coast Guard told deputies that similar packages have washed ashore from St. Augustine to New Smyrna Beach and they are trying to determine from where the narcotics originated. Flagler County Sheriff Rick Staly said the department has collected about 100 pounds on marijuana from beaches just on Wednesday alone. On Thursday, he said even more marijuana washed up, this time on the beach in Jungle Hut Park. Before deputies arrived, beachgoers were arguing over whether to keep the drugs or turn them into law enforcement.